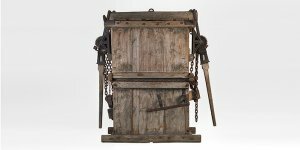 This forage press belonging to the family Bastide de Fourches was used until the 1940s. Since then, it was kept in the Bastide barn in Bony aux Nasses, in the town of Sablières. It was given by Angèle Bastide and her nephews and nieces to the MuCEM, Museum of Europe and Mediterranean Civilizations located in Marseille, in order to give it a second life and pay tribute to the Cevenol peasants and their ancestors. She has been exposed to the MuCEM since 2014. “This fodder press was designed to make hay bales. From a technical point of view, it marks the beginning of the mechanization of certain agricultural tasks, a transitional stage between a completely manual haymaking operation where hay was stored loose in granaries or millstones and the moment when hay bales Are carried out directly in the meadows with a towed baler. The press could be mobile. It required the presence of two men who operated the two lateral levers of the machine to raise a tray inside and compress the hay on the sides of the machine. The binding of the bullets was done manually, by opening the two side doors, with wires of iron or binder string. Finally, this work was still very manual and required a lot of human energy and time. Nevertheless, this machine demonstrates a step towards the rationalization of agricultural tasks and the MuCEM did not have a machine of this type in its collections. Originally from Saône-et-Loire, the agricultural equipment factory Plissonnier settled in Lyon around 1847 and was booming thanks to Simon Plissonnier (1847-1931), an important figure in the agricultural world and deputy of Isère. This house manufactured a wide range of materials, participated in the development of mechanization and in numerous agricultural competitions in the regions and in Paris. At the Valence contest of 1897, Plissonnier won a silver medal for his forage press, inspired by an English model of Waite Burnell who appeared in France around 1877 (Journal of Practical Agriculture, June 17, 1897, volume I, no. 24, pp. 849-856). Information from the MuCEM website. One O One is a story that takes place between Sablières and Taipei. Yann Peira, producer and actor, with Sabliéroise sources, wanted to shoot (in 2008) in the village of his childhood. Two residents of Sablières played in this film: Thérèse Couderc and Claude Eschalier. With Yann Peira, Aleksandra Yermak, Cassandre Manet. In the city of Taipei, Abbas unremittingly searches for a girl who disappeared years ago. His companion, Lian, tries to get him out of the state of torpor that guides his wandering. But Abbas carries with him the obsessive memory of tragic events. Released in theaters in June 2012.